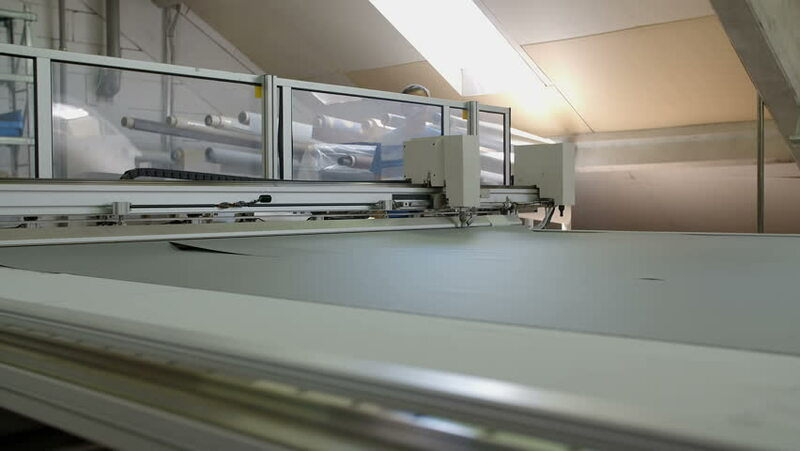 A machine is slowly moving on the production line and it is cutting fabric into two separate pieces. Wide-angle shot. hd00:13We can see a production line process in the factory. It looks huge and there is a big piece os fabric displayed there. Wide-angle shot. hd00:09TVER, RUSSIA - JUN 05, 2013: Kitchen furnishings in train in Tver Railway Carriage Plant. Plant is main supplier of passenger cars locomotive for Russian railways. hd00:16A woman is standing behind a production line and she is observing the process in the factory. Wide-angle shot. hd00:17A big machine in the factory is moving when a woman presses a few buttons. She is wearing protective gloves and she is observing the whole production process. Wide-angle shot. hd00:20Big machine on a production line is cutting fabric into two pieces. We can see that the machines are really big. Close-up shot. hd00:15A woman is lifting up one long piece of metal with her gloves. We can see many big machines all around. Wide-angle shot. hd00:15A worker in the factory is pressing a few buttons to control the machine on the production line. Wide-angle shot. hd00:10A worker in the factory is pushing two buttons on the screen at the same time. Close-up shot. hd00:18A machine in the factory is cutting a big piece of fabric. The production line has a long process in this manufacture. Wide-angle shot.